The aim of this study was to investigate the effect of downregulating Hedgehog pathway by GANT61 on human glioma cells, examine the consequent changes of temozolomide (TMZ)-induced effects and explore the molecular mechanisms. The cytotoxicity of a Gli1/2 inhibitor, GANT61 was examined both alone and in combination with TMZ in human glioma cell lines. The mRNA and protein expression alterations were determined by quantitative real-time polymerase chain reaction (qRT-PCR) and Western blot, respectively. CCK-8 assay detected the cell proliferative capability. Apoptotic cell number was measured by flow cytometry. The transwell assay was used to test the cell invasive capability. DNA damage effect was identified by COMET assay and γH2AX expression. Proliferation of tumor cells treated with GANT61 in combination with TMZ was significantly suppressed compared with those treated with either drug used alone. The combination treatment induced a higher rate of apoptosis, DNA damage and reduced the invasive capability of glioma cells. DNA damage repair enzyme MGMT and the Notch1 pathway increased in the cells treated by TMZ treatment. However, GANT61 could abrogated the protein increasing. GANT61 sensitizes glioma cells to TMZ treatment by enhancing DNA damage effect, decreasing MGMT expression and the Notch1 pathway. Glioma is the most common primary malignant brain tumor in adults [1, 2]. Despite the development of aggressive comprehensive treatments, the median overall survival (OS) of patients with glioblastoma (GBM), the most malignant type of glioma, has only marginally changed over the past 25 years and still remains about 12 to 15 months [3–6]. Thus, novel therapeutic approaches to cure this malignancy are urgently needed. Temozolomide (TMZ) is an oral chemotherapeutic drug for GBM which penetrates into the brain and damages DNA by the induction of DNA O6-methylguanine [4, 7–10]. However, the DNA repair enzyme O6-methylguanine methyltransferase (MGMT) could abrogate the cytotoxic O6-methylguanine DNA adduct before it causes harm, which may be the important mechanism of TMZ resistance [11, 12]. Indeed, lower response to TMZ treatment has been observed in patients with high MGMT and inactivation of the MGMT gene is associated with longer patient survival [13, 14]. In addition, the Hedgehog (Hh) pathway involving in development and cancer, is indispensable for epithelial-to-mesenchymal transition (EMT), metastasis and invasion, cancer stemness, and chemoresistance [15–17]. Moreover, the inhibition of the activity of GLI, the functional transcription activators of the Hh pathway, can interfere with almost all DNA repair types in human cancer, which indicates an important role of Hh/Gli in tumor cells’ survival from DNA damage induced by chemotherapy or radiotherapy . Sonic hedgehog could promote tumor proliferation in a Notch-dependent manner [19–22]. The Hh and Notch pathways interact to control the EMT/MET . Hes-1, a primary target gene of Notch1, can be activated by both Notch and Hh signaling [23–25]. Thus, Hh signaling may serve as an important therapeutic target to overcome DNA repair induced by TMZ treatment and consequently, to increase the chemotherapeutic response in the treatment of cancer. In the present study, we investigated the effect of Gli1/2 downregulation by GANT61 on TMZ induced cytotoxicity in U87 and U251 glioma cells. By comparing the effects of GANT61, TMZ treatment, and their combination in glioma cell proliferation, invasion/EMT, and apoptosis, we found a synergistic action between GANT61 and TMZ treatment. Our results revealed the important role of GLI inhibitor GANT61 in enhancing the sensitivity of glioma cell for TMZ. Gene expression profiling datasets were obtained from the Chinese Glioma Genome Atlas (CGGA)  (http://www.cgga.org.cn), including the mRNA array of 305 samples and RNA sequencing of 105 samples. Human GBM cell lines U251 and U87 were purchased from the Chinese Academy of Sciences Cell Bank. A human oligodendroglia cell line (OL) was a kind gift from Prof. Fengmin Zhang of Harbin Medical University. The cells were maintained in a 37 °C, 5% CO2 incubator in Dulbecco’s Modified Eagle’s Medium (DMEM, Corning, USA) supplemented with 10% fetal bovine serum (FBS, Biological Industries, Israel). We assembled the Cancer Cell Line Encyclopedia (CCLE) (www.broadinstitute.org/ccle) and screened 208 differential expressive genes (Additional file 1A, Fold changes ≥ 2), including GFAP, S100B, IGFBP2 (Additional file 1B) and so on. TMZ (Sigma-Aldrich, USA) and GANT61 (Selleck Chemical, USA) were dissolved in 10% dimethylsulfoxide (DMSO, Sigma) to create a stock solution (TMZ: 100 mg/ml; GANT61: 10 mM). DMSO concentration was kept below 0.1% in all the cell cultures and did not exert any detectable effect on cell growth or cell death. Recombinant Human Shh (rShh, 1 μg/mL) was purchased from R&D, Minnesota, USA. Primary antibodies used for Western Blot analysis were rabbit anti-Gli1 (CST, USA), Gli2 (Proteintech, USA), N-cadherin (CST), Vimentin (Abcam, England), Fibronectin (Abcam), Notch1 (Abcam), Hes1 (Abcam), MGMT (Proteintech), γH2AX (CST), GAPDH (Wanleibio, China) and mouse anti-E-cadherin (CST); horseradish peroxidase–conjugated secondary antibody (goat anti-rabbit or anti-mouse) were purchased from ZSGB-BIO. The cytotoxicity of TMZ and GANT61 on U87 and U251 cells was determined by Cell Counting Kit-8 (CCK-8, Dojindo, Japan) assay. Tumor cells were seeded at 2-5 × 103 cells/well (0.1 ml) in 96-well flat bottom plates and incubated overnight at 37 °C. After exposure to the above described treatment for 24, 48, and 72 h, CCK-8 (10 μl, 10%) was added to each well once every hour before incubation ended. Then its absorbance at 450 nm was measured by a microplate reader (IMARK). All experiments were repeated in triplicate. U251 and U87 cells were plated in 6-well plates and treated with TMZ or GANT61 or a combination of the two. The apoptosis ratio was analyzed 48 h post-treatment via using Annexin V-FITC Apoptosis Detection Kit (BD Biosciences, San Diego, CA) according to the manufacturer’s instructions. Annexin V-FITC and propidium iodide (PI) double staining was used to evaluate the percentages of apoptosis. Annexin V− and PI− cells were used as controls. Annexin V+ and PI− cells were designated as apoptotic, and Annexin V+ and PI+ cells as necrotic. Tests were repeated in triplicate. Transwell membranes coated with Matrigel (BD Biosciences, San Jose, CA) were used to assay the invasive ability of glioma cells in vitro. Treated cells were plated at 5 × 104 per well in the upper chamber in serum-free medium. FBS 10% was added to the medium in the lower chamber. After incubation for 24 h, non-invading cells were removed from the top well with a cotton swab, while the bottom cells were fixed with 95% ethanol, stained with 0.1% crystal violet, and photographed in three independent 10× fields for each well. Three independent experiments were conducted and used to calculate fold migration relative to the blank control while the error was calculated as the standard error (SE). Cell lysates were harvested, equivalent amounts of total protein were separated by 10% SDS polyacrylamide gel electrophoresis (SDS-PAGE), and transferred to polyvinylidene difluoride (PVDF) membranes. After blocking with 5% fat-free milk and 0.1% Tween-20 in tri-buffered saline with Tween (TBST) for 1.5 h at room temperature, membranes were incubated with diluted anti-Gli1, Gli2, E-cadherin, N-cadherin, Vimentin, Fibronectin, MGMT, Notch1, Hes1, γH2AX (Ser139) and anti-GAPDH primary antibodies. Horseradish peroxidase-conjugated anti-mouse or anti-rabbit secondary antibodies were used, and bound antibodies were detected using the ECL system. Total RNA was extracted using Trizol Reagent (Invitrogen, USA) according to the manufacturer’s instructions. Total cDNA was reversely transcribed from 1 μg of total RNA (Perfect Real Time, Takara, Japan). To quantify gene expression, two-step qRT-PCR was performed using a FastStart Universal SYBR Green Master (ROX) by Roche LightCyclerR Real Time System. Expression levels were normalized to glyceraldehyde-3-phosphate dehydrogenase (GAPDH). The PCR conditions were hot-start at 95 °C (15 s), with annealing and extension at 60 °C (60 s) for 40 cycles, followed by a melting curve analysis. All qRT-PCR data were analyzed using the 2-ΔΔCt method. And the primers used are shown in Additional file 2. The comet assay (Trevigen, Gaithersburg, MD) was performed according to the manufacturer’s protocol using alkaline conditions. Cell samples were handled under dimmed light to prevent DNA damage from ultraviolet light. Combine cells at 1 × 105/ml with molten LMAgarose and immediately pipette 50 μl onto CometSlide. After placing slides flat at 4 °C for 10 min, immerse slides in lysis solution for 60 min and freshly prepared Alkaline Unwinding Solution, pH > 13 for 20 min. Electrophoresis was carried out at the rate of 1.0 V/cm for 30 min. The slides were removed from the electrophoresis chamber, washed in deionized water for 5 min and in ice cold 70% ethanol for 5 min. Subsequently, the slides were air-dried, and DNA was stained with 50 μl of SYBR Green I dye (Sangon Biotech, 1:10,000 in Tris-EDTA buffer, pH 7.5) for 30 min and immediately analyzed using a fluorescence microscope (Axiovert 200, Carl Zeiss). Data was analyzed using CometScore (TriTek, Sumerduck, VA). Gene set variation analysis (GSVA) with Gli expression was analyzed by GSVA package  of R (https://www.r-project.org/). Data are presented as mean ± SD. All statistical analyses were performed using SPSS version 13.0 software (Chicago, IL, USA). The Student’s t-test was used to analyze the difference between the means of treatment and control groups. One-way analysis of variance (ANOVA) was used to analyze the significance among three or more groups, and the Fisher’s least significant difference (LSD) method was used for multiple comparisons when the probability for ANOVA was statistically significant. Data were considered statistically significant at P <0.05 level. As shown in Fig. 1a, patients with glioblastoma containing high or low expression of Gli1 showed a considerably different prognosis in the CGGA mRNA array dataset and RNA sequencing dataset. Patients with low expression of Gli1 had a favorable prognosis in CGCG (P = 0.0177 and P = 0.0301, respectively). Cox regression analysis also revealed that GLI expression was associated with the overall survival of patients with glioblastoma from the CGGA mRNA and RNA sequencing datasets (P = 0.019, HR = 1.588, 95% CI = 1.080–2.334; P = 0.032, HR = 1.687, 95% CI = 1.045–2.725, respectively). Gene set variation analysis (GSVA) illustrated that GLI was associated with several biological behaviors besides the Hh pathway, including positive regulation of the DNA metabolic process and DNA damage response signal transduction, and negative regulation of DNA binding and protein-DNA complex assembly (Fig. 1b). Up- and downregulated genes associated with indicated biological behaviors went positively and negatively related to GLI expression. These function analyses were related to DNA metabolism, replication, DNA damage repair and glioma malignant progression. Therefore, we thought to find out the role of Hh inhibitor GANT61 in glioma cells’ survival. In our present study, we confirmed that GANT61 (Fig. 2a) could inhibit the Gli1/2 expression (Fig. 2b and c. *P < 0.05, **P < 0.01). To clarify the action of GANT61 as a single antitumor agent, we first performed a CCK-8 assay using U87 and U251 glioma cells treated with GANT61 at concentrations of 1.25 to 20 μM for 24, 48, and 72 h, respectively. As shown in Fig. 2d, GANT61 exerted an inhibitory effect on glioma cells in a dose and time dependent manner (*, &, # P < 0.05; **, && and ## P < 0.01; ***, &&& and ### P < 0.001 compared to Control). The concentration of inhibited cell viability (IC50) was 10.24 μM for 24 h, 4.38 μM for 48 h, and 4.39 μM for 72 h in U87 cells, while it was 7.38 μM for 48 h, and 7.59 μM for 72 h in U251 cells. However, treatment with GANT61 at the same concentration for the same amount of time did not induce significant cytotoxicity of human OL cells, except for those treated at 20 μM (Additional file 3). The transwell assay revealed that the numbers of invasive cells at different concentrations of GANT61 were significantly reduced compared with the control group (Fig. 2e and f. * P < 0.05, **P < 0.01, ***P < 0.001). Next, we observed that the population of apoptotic cells was larger among the glioma cells treated with GANT61 than the untreated cells (Fig. 2g and h. *P < 0.05, **P < 0.01). To detect the cytotoxicity of combining TMZ and GANT61, we first used a CCK-8 assay to determine the sensitivity of U251 to the TMZ. The result showed that the medial IC50 was 124 μM and 99 μM at 48 h and 72 h, respectively (Additional file 4). We referred to previous reports [28, 29] for the TMZ sensitivity of U87. As shown in Fig. 3b, the combined effect of TMZ and GANT61 exhibited the highest of proliferation inhibition effect (*P < 0.05, **P < 0.01 vs. control at 24 h and 48 h). 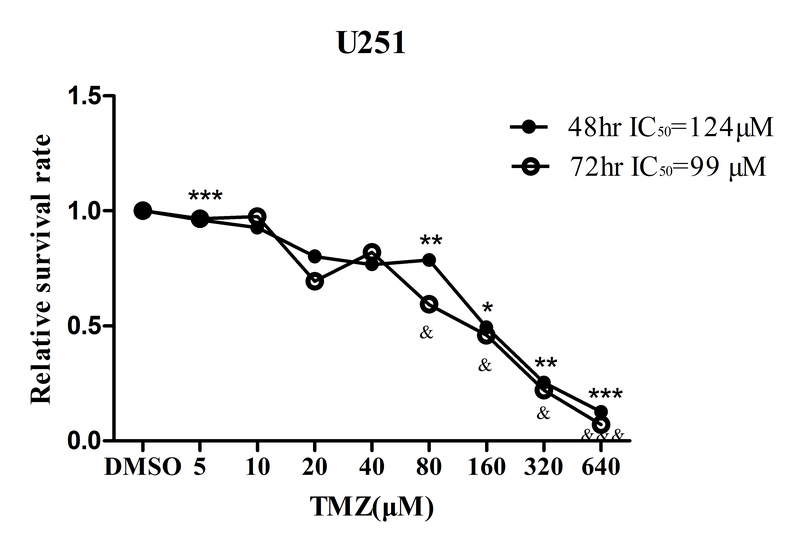 This GANT61–induced potentiation of the effects of TMZ was recognized at a lower concentration than that needed to induce cytotoxicity with TMZ alone. Isobologram analyses indicated that the effects of the combinations of GANT61 and TMZ in both U87 and U251 were both synergistic. Then, a transwell assay was performed to demonstrate that TMZ plus GANT61 suppressed the invasive capability of glioma cells. As shown in Figs. 2e, f and 4, the invaded cell numbers in the GANT61 group were smaller than those in the Control group, showing a negative effect of GANT61 on the invasion ability of U251 and U87 cells (P < 0.05). Compared to the TMZ treatment, the combination of GANT61 and TMZ treatment caused a more significant reduction of the invasion rate (Fig. 4. *P < 0.05, **P < 0.01). Next, after 2 days of treatment with the combination of TMZ and GANT61, a significant increase in the number of apoptotic cells was noted when compared to TMZ or GANT61 used alone at the same dose (Fig. 5. *P < 0.05, **P < 0.01). The result indicated that GANT61 enhances TMZ-induced apoptosis. QRT-PCR analysis revealed a significant increase of epithelial cadherin (E-cadherin) mRNA expression and a significant decrease of mesenchymal markers N-cadherin, Vimentin, and Fibronectin expression in GANT61 treated glioma cells (Fig. 6a and b). Interestingly, glioma cells also exhibited lower transcript levels of N-cadherin, Vimentin and Fibronectin, and upregulated E-cadherin transcript after incubation with 100 μM TMZ for 48 h. Compared with TMZ treatment alone, combined TMZ and GANT61 induced a further reduction of N-cadherin, Vimentin, and Fibronectin expression and augmented the elevation of E-cadherin transcript (Fig. 6a and b). Further, we tested whether these treatments could modulate the expression of proteins that regulate EMT. Results of Western blot were manifested according to the protein level alterations. Similar conclusions could be drawn based on Western blot analysis. (Fig. 6c and d). To elucidate the mechanisms by which the combination of TMZ and GANT61 lead to more tumor cells growth retardation or apoptosis, glioma cells were treated with GANT61 (5 μM), TMZ (100 μM) or both of them for 48 h. Gli1 and Gli2, which are associated with TMZ resistance and TMZ-activated DNA damage repair, were obviously down-regulated compared with the single therapy groups (Fig. 7a). Phosphorylated histone H2AX (γH2AX) is used as a biomarker of cellular response to DNA double-strand breaks (DSBs), and its potential for monitoring DNA damage and repair in human populations has been explored in many studies [30, 31]. Herein, the expression of γH2AX was examined following exposure to GANT61 and (or) TMZ for up to 40 h. TMZ treatment alone triggered phosphorylation of H2AX slightly, whereas a much higher level of γH2AX was observed after GANT61 was added (Fig. 7b), suggesting substantially more unresolved DNA DSBs in the combination treatment versus single-treated cells. In addition, single cells were analyzed by the COMET assay, which detects DNA damage by altering the pattern of cellular elution through agarose gels. Compared to groups treated with TMZ or GANT61 alone, significant changes in elution profiles were detected in the combination of TMZ and GANT61-treated cells by fluorescence microscopy, Tail Moment and Tail Length (Fig. 7c and d). This indicated a role of DNA damage signaling in combination of TMZ and GANT61-induced cytotoxicity. Collectively, data demonstrated that the combination of Hh-inhibitor and TMZ result in more evidently reduced cell growth, increased cell death and induction of DNA damage that is associated with reduced Gli1 and Gli2 protein levels. These findings emphasize the significance of the Hh signaling pathway in human glioma cell growth and survival, regulated at the level of the GLI genes. Glioma cells treated with TMZ exhibited significant increases in MGMT, Notch1 and Hes1 mRNA, and protein levels (Fig. 8a and b). However, these upregulations were suppressed by GANT61, as shown in Fig. 8. Also, MGMT, Notch1 and Hes1 expression levels in the GANT61 group were obviously lower than those in the control group (P < 0.05, **P < 0.01). To further demonstrate the importance of the Hh pathway in the regulation of MGMT and the Notch1 pathways, treatments of Shh, or a combination of Shh and TMZ were performed, and the results showed increased MGMT, Notch1, and Hes1 expression following Shh exposure. Moreover, Shh augmented the TMZ-induced effect when combined with Shh and TMZ, compared to TMZ alone. (*P < 0.05, ***P < 0.001). This indicated a regulatory role of GANT61 in the regulation of expression of MGMT and the Notch1 pathway. However, further study is needed to confirm this. GBM, characterized by a high proliferative and invasive capability, is refractory to traditional surgical tumor resection supplemented with chemotherapy or radiotherapy. Thus, the outcome of GBM patients remains poor . Alkylating agents, including TMZ and carmustine, readily cross the blood–brain barrier and show cytotoxicity against GBM . TMZ induces DNA lesion O6-methylguanine, and this would activate the repair pathways in feedback, accounting for TMZ-resistance . Emerging literatures have revealed that Hh signaling affects almost all DNA repair types by enabling tumor cells to survive DNA damage induced by chemotherapy . In addition, activating mutations in the Hh pathway causes a large percentage of tumors . GLIs are the effector molecules of the Hh pathway and therefore we investigated the role of GLI-specific inhibitor GANT61 in glioma survival. In our study, GANT61 alone could dampen the proliferation of glioma cells. Moreover, GANT61 potentiates TMZ cytotoxicity due to inhibiting DNA damage-repair initiated by TMZ treatment. Treatment with the same doses (2.5 to 10 μM) for the same period (24/48 h) does not cause significant damage to OL cells, which suggests appropriate doses for studying in vivo or clinical investigation. This is conducive to the development of precision treatment. 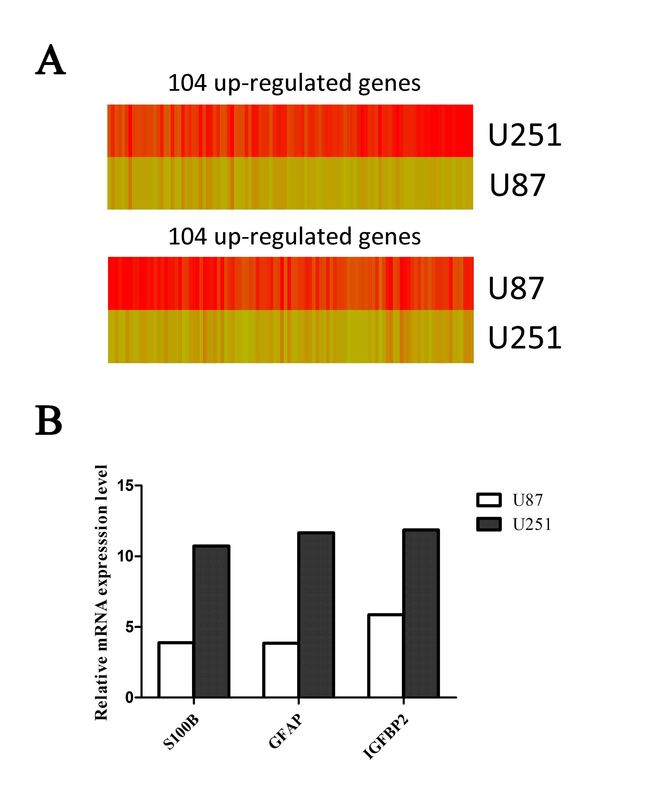 Simultaneously, elevated expression of the repair protein MGMT also results in TMZ resistance . MGMT can eliminate the cytotoxic O6-methylguanine DNA adduct . In our study, we found that TMZ treatment increased the expression of MGMT, but is abolished by GANT61. This suggests that blocking the Hh pathway enhances the cytotoxicity of TMZ in glioma cells by downregulating the expression of MGMT. As described above, GANT61 sensitized glioma cells to TMZ via enhancing apoptosis and inhibiting proliferation/invasion. However, the downstream factors mediating these effects remain to be investigated. The expression of a series of tumor suppressors and oncogenes relating to cancer cell apoptosis, invasion and TMZ resistance were compared among glioma cells treated with TMZ or GANT61 or a combination of the two. We found that Notch1 and Hes1 were significantly upregulated in TMZ-treated glioma cells, but not in the combination of TMZ and GANT61-treated glioma cells. Notch1 and Hes1 have been demonstrated to be important oncogenes playing critical roles in glioma cell survival and TMZ resistance . Furthermore, the Notch pathway interacts closely with the Hh pathway. For instance, Notch directly suppresses Hh via Hes1-mediated inhibition of Gli1 transcription . Ectopic Notch activation increases Gli2 protein . Hh signaling promotes proliferation of monociliated choroid plexus tumor cells in a Notch-dependent pathway . Inactivating Hh results in decreased expression of the Hh/Notch signaling component . Inhibiting the Hh pathway suppresses Notch signaling and induces a mesenchymal-to-epithelial-like transition . Both the Hh and Notch pathways participate in tumorigenesis and TMZ resistance. Thus, it is logical to suppose that glioma cells resistant to TMZ and protect themselves partly through the activity of Notch1 pathway, while GANT61 somehow abrogated this upregulation, reducing the chemoresistance and at last sensitizing glioma cells to TMZ. The activation of the Notch pathway after TMZ therapy was suspected to confer DNA damage repair. However, further study is required to confirm this. EMT is a process whereby cells acquire morphologic and molecular alterations that facilitate tumor metastasis and progression. Emerging evidence associates chemoresistance with the acquisition of EMT in cancer [38, 39]. The induced EMT was associated with increased cell motility, invasiveness, and clonogenicity. Hh signaling promotes EMT, and antagonizing Hh signaling inhibits EMT in a GLI-dependent manner [40–44]. Herein, we investigate the combination effect of GLI inhibitor and TMZ on EMT. To the best of our knowledge, this is the first report that treatment with a combination of TMZ and GANT61 can reverse the EMT of glioma cells. To conclude, downregulation of the Hh pathway by GANT61 enhances the cytotoxicity of TMZ via inhibiting proliferation, suppressing invasion/EMT, and inducing apoptosis. The synergistic mechanism is suggested that down-regulation of the Hh pathway by GANT61, which enhances DNA damage effect and suppresses MGMT and the Notch1 pathway, induces sensitivity to TMZ. These results indicated that GANT61 may represent a potential targeted inhibitor for glioma treatment and may increase the chemo-sensitivity of glioma to TMZ. We thank Dr. Yanhong Liu and Fei Gao for technical assistance. This study was supported by the Research Special Fund for Public Welfare Industry of Heath (No. 201402008), the National Key Research and Development Plan (No. 2016YFC0902500), the National Natural Scientific Fund (No. 81572701, No. 81372700, No. 8140100730, No. 81572743. ), the Special Fund Project of Translational Medicine in the Chinese-Russian Medical Research Center (No. CR201417), the Research Project of Chinese Society of Neuro-oncology, CACA (No. CSNO-2014-MSD08), the Postdoctoral Science Foundation of Heilongjiang Province (LBH-Z14220), the Natural Scientific Fund of Heilongjiang Province (H201417), and the Research Project of the Health and Family Planning Commission of Heilongjiang Provincial (2013048). Conceived and designed the experiments: CLJ and JHZ, Performed the experiments: JLL, Analyzed the data: JLL and JQC, Contributed reagents/materials/analysis tools: JLL, SHZ, KY, YS and YLL, LCC, RYL and XWZ, Wrote the paper: JLL and JQC, All authors contributed significantly, and were in agreement with the content of the manuscript. All authors read and approved the final manuscript.